I spoke with John Benz today and we talked about the demand for his BLACK HORNS. 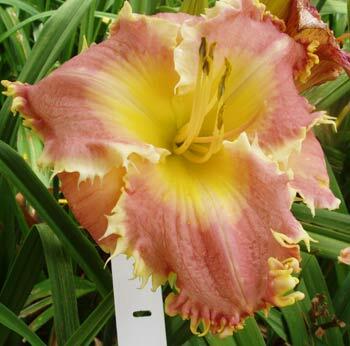 John sold the “collection only” daylily on Mike Longo’s Lily Auction at a closing price of $780.00. He was very pleased that BLACK HORNS commanded such a price. 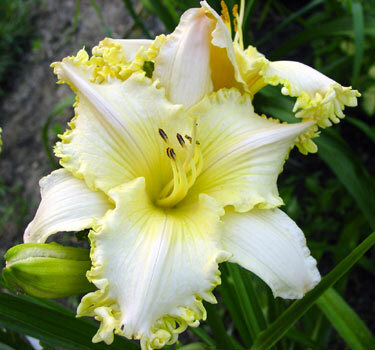 John stated that he thought it was a record price paid for an introduced daylily on the Lily Auction. I think I’ve mentioned that I’ve used BLACK HORNS for several years. 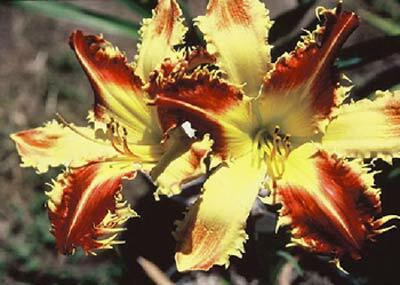 The daylily passes on monster teeth in a narrow form. Other hot items that it also gives up are tall scapes and dormancy. If BLACK HORNS has a weakness, it would only be in my view, color. It has been very difficult to break out of the burnt orange gritty look. 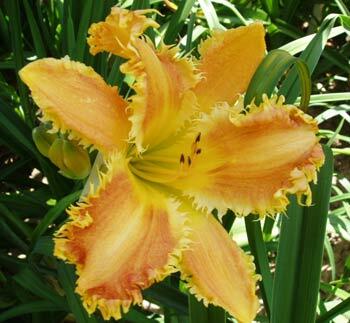 However, those hybridizers with line bred purples,oranges and reds or color cleaners probably won’t mind using it as there has been successes with other hard to improve upon daylilies such as BASS GIBSON. A closing “good note” to all hybridizers is that in speaking to many club members over the past year , a percentage of them still like the burnt orange look. So what I may view as bad color others view as desirable color. I guess that is why the saying “Beauty Is In The Eye Of The Beholder” is alive and well. 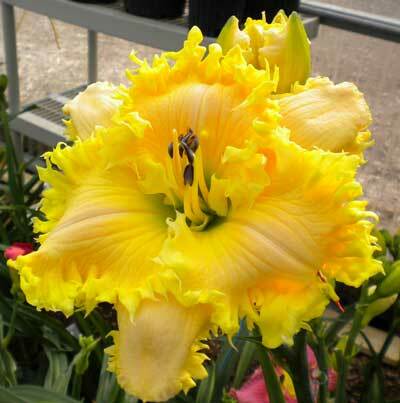 Image provided by Dave Mussar illustrating a daylily that I’d call an “atypical horned daylily” Dave tells me that there isn’t any Tet. Spindazzle in the background. Thanks Dave. Hi all, It’s been a while since I’ve made my last blog post. After speaking with my good friend John Benz this afternoon, he encouraged me to get back at blogging ASAP. 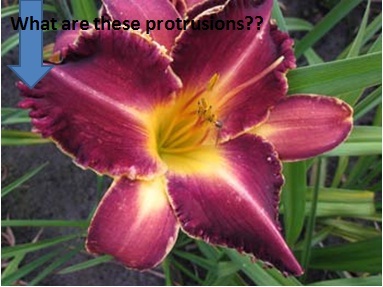 We talked for a while and there was a lot on his mind about daylily teeth and the direction they are heading. John likes “large”. So he is partial to teeth daylilies with taller scapes and large flowers and big teeth. 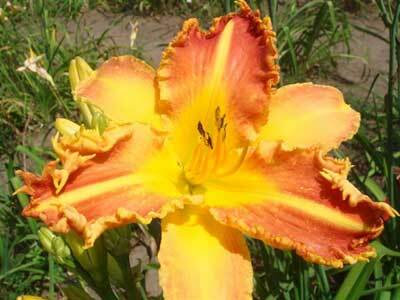 His 2011 BLACK HORNS is his favorite tooth daylily to date that has been introduced. It has three doses of Tetra Spindazzle in it, two doses of Forestlake Ragamuffin and a dose of Startle(lots of dormancy). 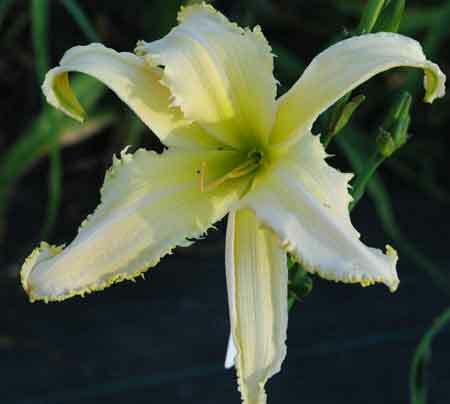 Leading daylily expert, Jeff Salter while visiting John Benz said “he’d only dreamed of the teeth the size on BLACK HORNS”. He had to have it. While BLACK HORNS isn’t black, the name was derived from Jamie Gossard referring to it as a darker “HORNS”. Of course Jamie HAD to have it. I’ve personally seen and grow kids out of BLACK HORNS and would rate it as being very important for producing introductions for hybridizers. 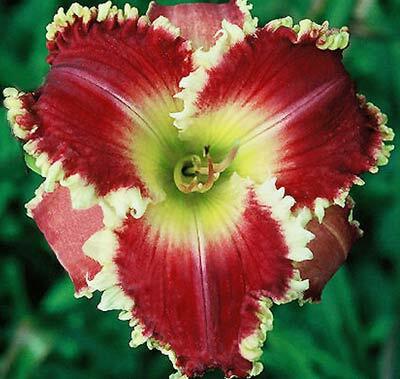 I’ll be back Monday morning on the Daylily Teeth Blog. Thanks to Dr Grant-Downtown and John Benz. 7T48A [(Annette's Magic X Horny Devil) X Who Dey! 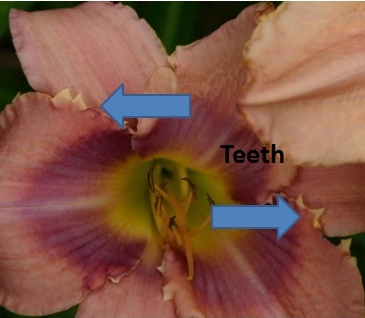 “I have two toothy seedlings that are well endowed with teeth, and in looking at them this morning, I compared their teeth, and one seems to have more of the “teeth” form while the other had more the “tendril” form. These seedlings were from my last two years of seedlings, so haven’t had the opportunity to see what they can do yet, but I do have seedlings growing from both with various crosses, so this bloom season we should see what 7T48A can pass on/do and then next year for 8T327A. My numbering system uses the year that the seed was made, not the year of first bloom. I’d like you to see what I am trying to say about teeth and tendrils; just my take on the difference. 7T48A [(Annette's Magic X Horny Devil) X Who Dey!] has many of the spinney type teeth/tendrils, while 8T327A (Ruffled Strawberry Parfait x Iwanna Piranha) has the wider teeth from where they break away from the petal edge. Thinking of “tendrils” reminds of the catfish spines, while teeth reminds me of our “dogs teeth”. Thanks David! 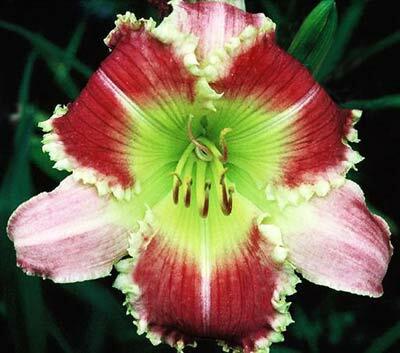 We’ll be back in discussion Monday morning on the daylily teeth blog. Have a nice weekend. In speaking with David Kirchoff last week, I asked him where the term “teeth” originated. David said the term possibly can first be attributed to three people. Betty Woods, Ra Hansen, and Mort Morss. Mort bloomed SHARK’S TOOTH (image one) in the early 1980’s and that is where he first used the word. One of the parents to SHARK’S TOOTH is CHICAGO KNOBBY(image two). Roy Woodhall explained to me that the term “Knobs” was used prior to the term “Teeth”. 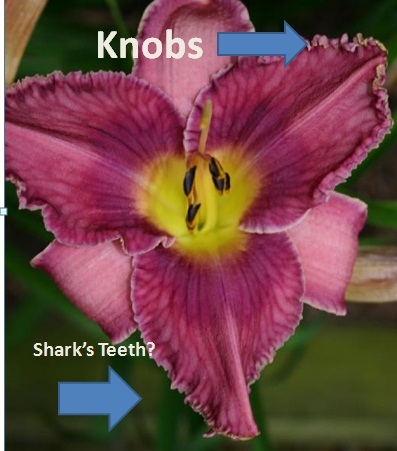 Knobs have rounded tips opposed to pointed tips of Shark’s Tooth. 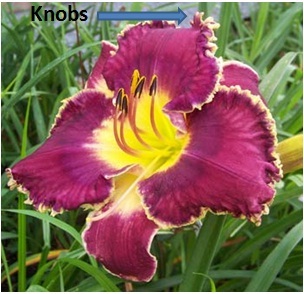 Roy did say that some early daylilies that were described as “Knob Edged” may have also exhibited what we now refer to as “Teeth”. The image of SHARK’S TOOTH clearly shows teeth. While the image of CHICAGO KNOBBY displays knobs and tiny sawteeth. If anyone else has more to add to the orgin of the term “Teeth” please let us know. 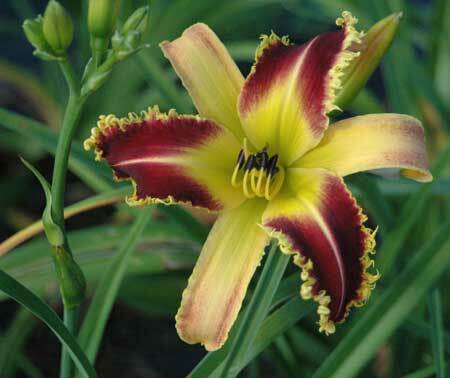 More tomorrow on the daylily teeth blog. Thanks David , Mort, and Roy.